Letter recognition games are some of our favorites, especially ones that lead to name recognition. Today’s exciting outdoor activity is being shared by Nicole of Modern Preschool. I am enjoying some time with brand new baby #3, so I am thrilled for her to guest post. You can follow Modern Preschool on the website, facebook , or her TPT store. Changing up the routine and bringing learning outside is a great way to keep young children engaged! 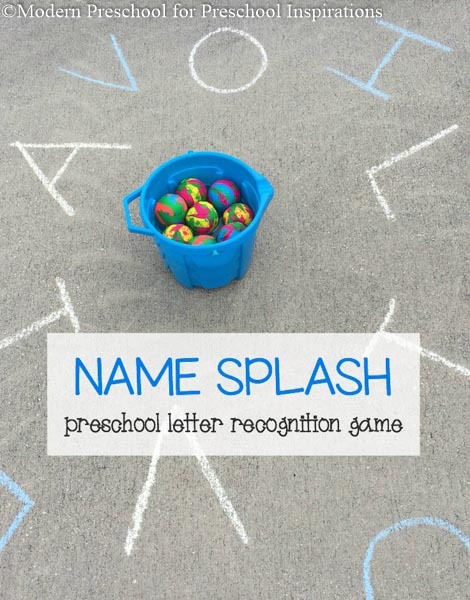 Learning activities, like The Name Splash Letter Recognition Game, help preschoolers recognize and practice the letters in their names. 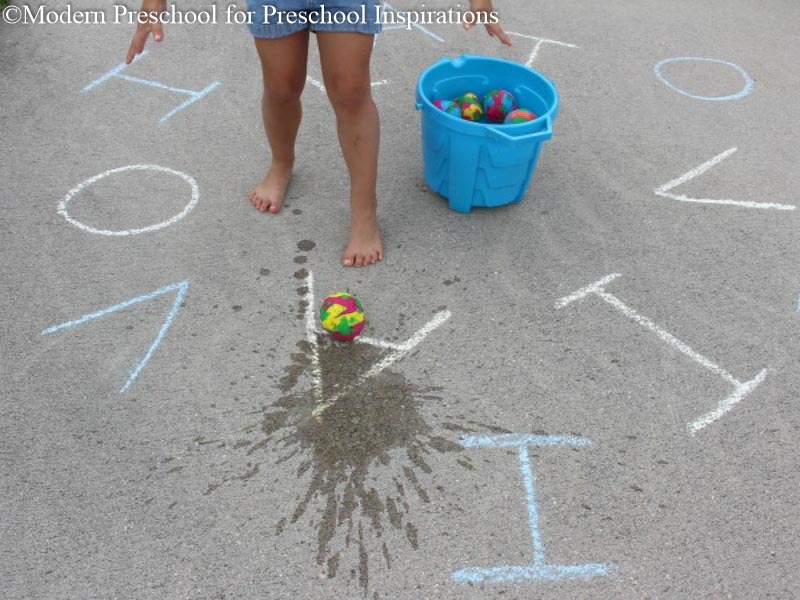 Practicing letters while playing with water and throwing balls is sure to be a hit! Working on hand-eye coordination, gross and fine motor skills, and letter recognition is an added bonus! How to play Name Splash! The supplies are simple for this game. 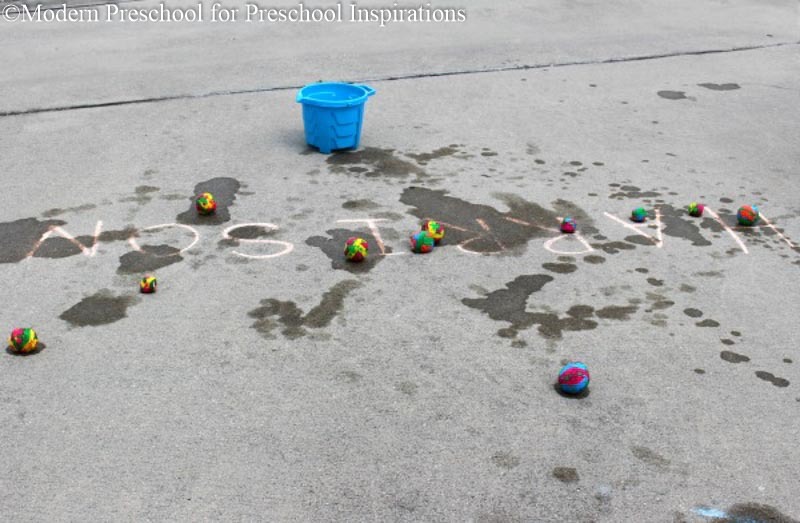 Grab a few sets of splash water balls from the dollar store, chalk, and a bucket filled with water. Add the balls to the bucket and give them a squeeze so that they fill up with water. Write the letters in your child’s name with chalk in a circle all around the bucket. Add a few sets of the letters to make the game last longer. Have your child stand in the middle of the letters. Each time you choose a letter, your child has to spin around to find the letter, and throw a splash ball at it! Pick another letter and do it again! For children who know the letters in their names, mix up the letters and write them out of order. Instead of naming a letter and having your child find it, have your child splash the letters in the correct order as quickly as possible! For children still struggling with letter recognition, write the letters in order in a straight line. Making up a tune or rhythm while saying the letters will help your child remember the order of the letters in his name. Splashing the balls at the letters while saying them will help with beginning recognition and build confidence! I played this game with my preschooler at home. We started with her name, and then started playing with the names of her friends too! After we filled up the driveway, she moved the game to our back patio and made up her own version. Simple, low prep learning activities are our favorite for reasons like this! The fun doesn’t have to end! 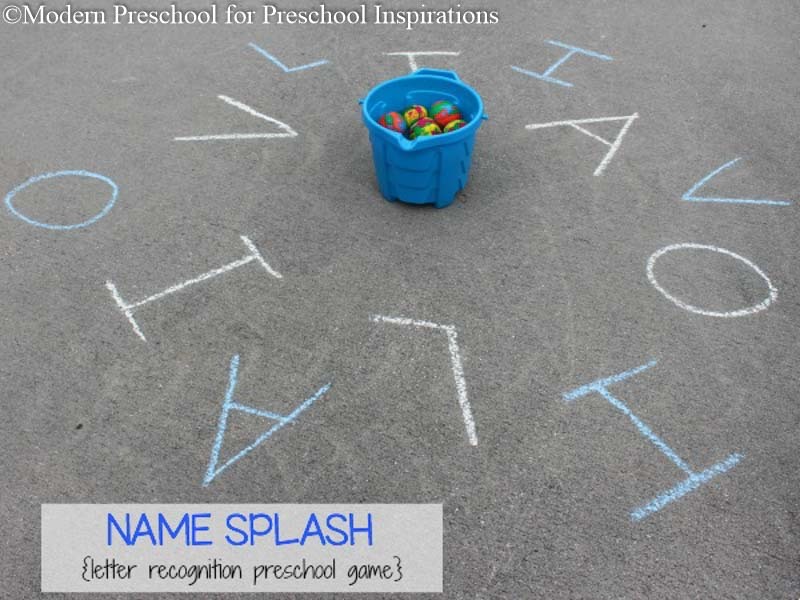 The Name Splash game can be played at home or on the sidewalk at preschool. It’s the kind of game that can be adapted to fit any situation and still be lots of fun! And if you’re feeling adventurous, fill water balloons to use in place of the splash balls!